Arabidopsis seedlings tilted at 45 degrees on hard agar surface. 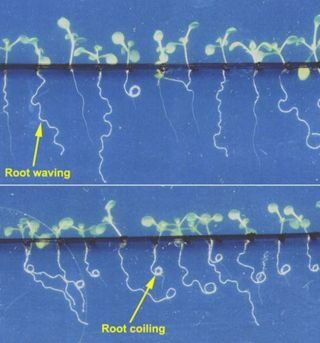 (Top) Wild type seedlings showing more root waving. (Bottom) Mutant strain showing more root coiling. A French astronautis tending a miniature garden on the International Space Station (ISS) as partof the first experiment inside the orbiting laboratory's new European researchmodule. EuropeanSpace Agency (ESA) astronautLeopold Eyharts is growing tiny seedlings inside the space station's Columbus laboratory, which he helped deliverduring last month's STS-122 shuttle flight. The WAICOexperiment — short for Waving and Coiling of ArabidopsisRoots at Different g-levels — could help scientists figure out how to growcrops in space for future astronauts during long space voyages. Eyharts isgrowing two types of Arabidopsis seeds, relatives of the mustard plant, in bothzero gravity and Earth gravity during the study. "We’regoing to see how they grow in microgravity," Eyharts told a group of 300students in Toulouse, France Tuesday via a video link. "They can live for a longtime on the International Space Station, but they’re not going to grow the sameway as they do on Earth." Eyhartssaid the experiment began in earnest a few days ago in Columbus' Biolab research rack, so it isstill too early to determine how his orbital crop is fairing. "Theoretically,we should be able to [analyze the] results and the samples when we get back toEarth," Eyharts said. Both a wildtype and a genetically modified type of seed will be left to grow for 10 to 15days. Biolab's video cameras will record the growth and allow Earth-boundobservers to see the plants progress in real-time. The experiment's lead scientist, professor Guenther Schererfrom the Leibniz University in Hannover, Germany, will observehow the different levels of gravity affect the normal spiraling and coilingroot growth. By the end of the experiment, Biolab will automaticallypreserve the seeds in their final state of growth for scientists to analyzeback on Earth. Eyharts will also take photographs of the plants' appearance atthat time. Biolab isone of several science experiments planned for ESA'sColumbus lab, which Eyharts is commissioning during his stint as anExpedition 16 flight engineer aboard ISS. The research module is Europe's largest contribution to the ISSproject. Eyharts and seedlings alike will return to Earth in lateMarch aboard the space shuttle Endeavour during NASA's upcoming STS-123mission.